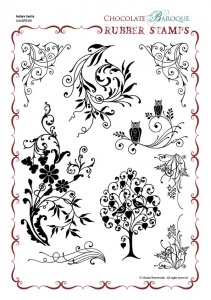 This rubber stamp set contains 9 images including 2 extra large flourishes, a tree with two love birds, a swirly branch complete with owl silhouettes and 2 pairs of corners. 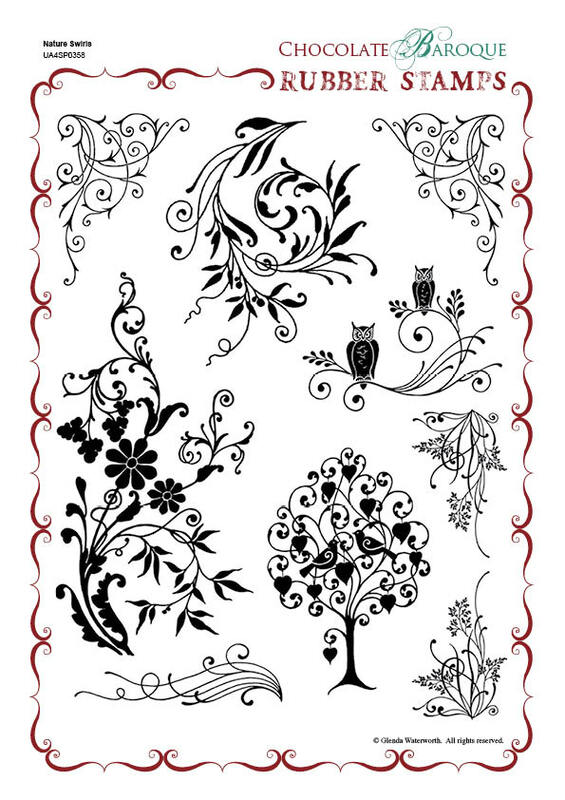 This set is fabulous for creating backgrounds and using parts of the stamps for borders, edges and fill-ins. A truly beautiful set. Hi, I first met Glenda at a craft demo in Redruth roughly six years ago. I was so intrigued by what she did, I found she was doing another class at nearby St. Agnes and went to that one as well. I loved her stamps and have quite a few of them, specially Natures Swirls which makes wonderful backgrounds as well as indiviual cards. Thanks Glenda. Thanks for my order delivered so swiftly. 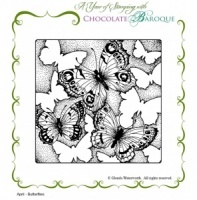 I have greatly enjoyed playing with this set of stamps, partly using your ideas from The Chocolate Baroque Guild newsletter and partly my own. Above all, I have enjoyed using them to try out the suggestions you made in the newsletter regarding using chalk inkpads. Out have come the inkpads that have been in storage, unused, for years - and the results have delighted me. I just loved these stamps the moment I saw them, and they did not disappoint, they are brilliant. I have already used them for wedding, anniversary and birthday cards. I know I am going to be using these stamps again and again. Thanks Glenda you've done it again good quality stamps we cannot do without. Love this set. Stuck it to the EZMount, cut it out and off I went. Made several completely different cards with it straight away. Love the results of stamping off the page around the edge with the medium swirl, made a couple of ghostly, shimmery owls, a sparkly love bird tree. Very versatile set with a good variety of sizes. Really glad I got it. I really love this set of stamps. I origionally bought them to decorate the edge of some of the Christmas cards I am making, but since recieving them I have seen lots of other possibilities. The designs are really unique and versatile. I can see them being used time and time again. Haven't used this as yet but thought it looked really lovely especially the owls as they are my favourite. Thank you for excellent service. Bought this set recently and I love it! Very versatile swirls, and the tree could even be used for Christmas, but it was the owls which made it a "must buy" for me! 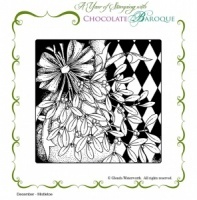 Great designs and great quality, as usual from Chocolate Baroque.